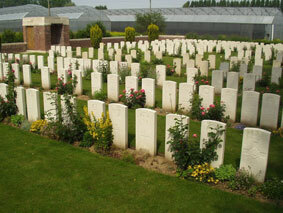 War Graves & Cemeteries, - Overseas (Battlefields) - "P"
The thumbnail images below link to a page for a cemetery relating to the Yorkshire Regiment. Simply click on one of the thumbnail images and a new window will open where you can find out more about that cemetery. of the 6 graves in this cemetery, 4 are for soldiers of the Yorkshire Regiment.